This town clock in historic Greenville bears the name of the insurance company that was once housed in the building that sits behind it. The year the company was founded is also emblazoned on the landmark. The building seen in this photo is actually the Westin Hotel, formerly known as the Poinsett Hotel, which is across the street from the clock and the former Liberty Life Insurance building. The Liberty Life Insurance Corporation began as the Southeastern Life Insurance Company in Spartanburg on November 3, 1905. A few years later the company moved to Greenville, and a former agent – W. Frank Hipp – began his own insurance company, Liberty Life Insurance, in 1919. The company was prosperous and eventually absorbed other insurance companies, and by 1931 Liberty had purchased the controlling interest of Southeastern Life Insurance. That same year, the company moved into the former Chamber of Commerce building. The Liberty and Southeastern companies finally merged in 1941. By 1968 the company had moved to a different location, and in 2000 the company was bought out by the Royal Bank of Canada. 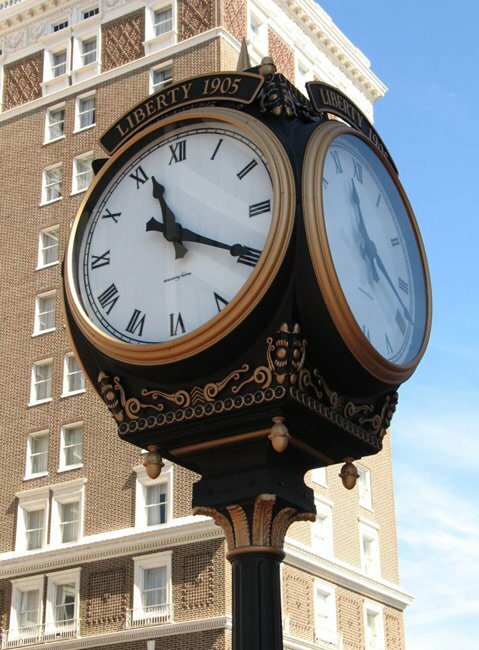 However, many beloved downtown Greenville sites, including this clock, Liberty Square, and the infamous Liberty Bridge, are named for the company which generously donated to the betterment of the Greenville community.